LONDON - Volkswagen's 'Bourne and Matrix' inspired ad has been banned pre-water shed after more than 1,000 people complained to the advertising watchdog. The VW campaign is shown as four TV ads and a cinema ad. 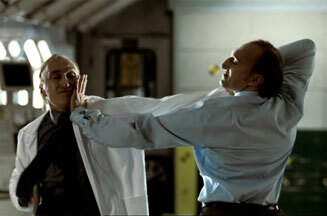 It shows a Volkswagen designer fighting and trying to outrun clones of himself on the shop floor of the car factory. The Advertising Standards Authority (ASA) has received 1,066 complaints about the level of violence in the ads. The ad is the fifth most complained about ad in the ASA's history. VW has said the ads are "metaphorical rather than real". The most graphic versions of the ad were restricted to post-7.30pm slots. One edited version had been shown earlier. The full-length ad had not been shown before 11pm. The ASA ruled against two versions of the TV ad that showed particularly graphic images, including fight scenes using car parts.